I will also provide a compatibility CD that will allow the game to run under ALL VERSIONS of Windows 10, 8, 7, Vista and XP, both 32 and 64 bit. This is the enhanced CD version which includes video interviews with German WWII vets and a multimedia gallery. 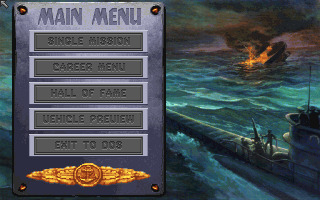 In Aces of the Deep you are the captain of a German U-Boat merchant killer during the Second World War. The first thing that strikes you when playing with Aces, either in 1994 or today, is the simulation's realism. 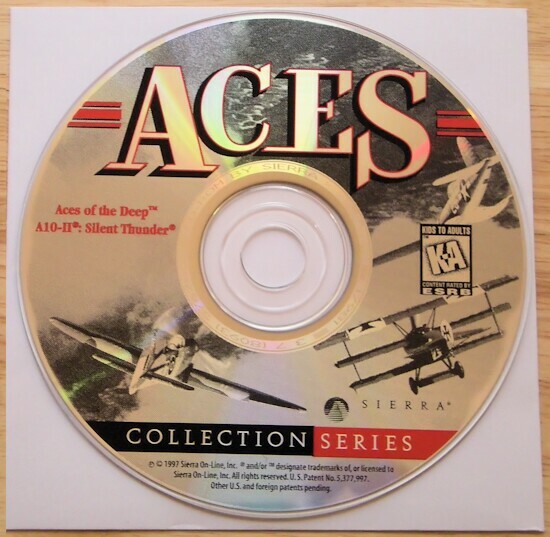 Similarly, as with all other games in the Aces series, the game has been created with a lot of attention to historical detail. As the captain of the submarine, you will give orders to the crew and your actions will be limited to the following: fire torpedoes, go to the bridge, look through the scope and plot the course. For example, if a plane comes to attack the ship, you will give orders to shoot it. Strategy holds an important part in the game. 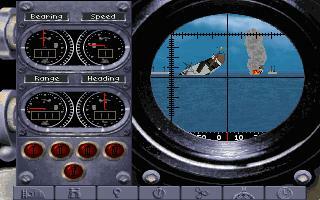 On the charts, you will plot the course of your ship to intercept convoys in the North Atlantic. Aces offers you a wide choice of single missions divided into three sections. Historical missions will place you in the same conditions experienced by captains in the past. The Convoy Encounter will let you customize the level of realism, select your type of U-Boat, set the meteorological conditions, and more, to provide you with good training. The last choice is the Warship Encounter, a serious challenge where you will have to battle against warships. If you feel a single mission is definitively too short for you, you can start a career and maybe get to have your name in the hall of fame. A choice of eight starting periods will be offered to you ranging from July 1940 to May 1945. In the same menu, you will also choose the emblem of your ship. When you start a mission, you find yourself in the main room where you will access the other control panels. The scope, for example, is in the middle of the room, and when you use it, you will see the seawater draining from the glass and your vision will be blurred for awhile before you can see what is going on. Then, sea waves will be the first thing that will catch your attention. The movement is so realistic that you might get dizzy after having watched them for too long. Two zoom levels are available on the scope to give you a detailed view of what you are going to blow up. With the help of torpedoes, you will sink merchant vessels and their escorts. Every time you fire a torpedo, an amazing animation will show the submarine launching a torpedo. If the torpedo reaches its target and destroys it, you will see the explosion and flames while the ship is sinking. The other panels control the speed, depth and compass. To set the course, you will have to click on the map and choose the zoom level. Starting from a general view of the North Atlantic, you can zoom in to see the convoy and your submarine on the map. You will establish your course very easily with the mouse aided by the information about target's course provided by your radio officer. On the map, you will also see a cone-shaped radar of a ship trying to locate you beneath the sea. It will show you when you have been spotted by the ship and it should help you to avoid it. Of course, this option is only available when the realism is set to easy. If you think it is taking too long to reach your way point, time can be accelerated up to 4096 times. Aces of the Deep out-classed all its predecessors with unparalleled realism and attention to detail. The choice of a challenging long-lasting career mode or short historical missions combined with a technically superb and realistic engine and strong graphics for the time made Aces of the Deep another fantastic installment in the legendary series. The visual effects of the rolling waves, whitecaps and fog are truly outstanding. 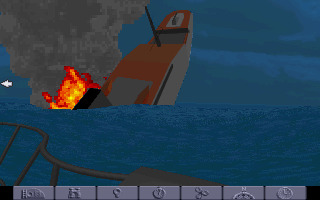 The sim has some pretty amazing special effects as well, such as explosions, dramatic sinking, and burning ships that look good even today. There are very detailed sound effects that include creaking breached hulls, the twisting of broken metal, accurate sonar effects, pinging and even some digitized German speech for real atmosphere. In short, the game captures the feel of WWII sub warfare perfectly.